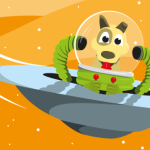 App News : Laika: The Dog in Space! After the successful educational application sCool Math, which was progressively created for the most widespread mobile platforms (iOS, Android, Windows Phone), ARTAX is introducing another achievement: Laika, The Dog in Space. The game is available for devices with iOS. You can download the game for free directly from App Store.